Stylish form meets superior function in the high-performance, wireless Harmon Kardon Go + Play speaker. Stylish form meets superior function in this high-performance, wireless loudspeaker. The portable Harman Kardon Go + Play™ Wireless fills any space with a full spectrum of high, mid, and resounding bass tones. Designed to work with the iPad® mini, iPad (4th generation), iPhone® 5, iPod® touch (5th generation) or iPod nano (7th generation), it streams music from any Bluetooth® device. And its HARMAN TrueStream™ wireless technology guarantees the highest-quality sound. 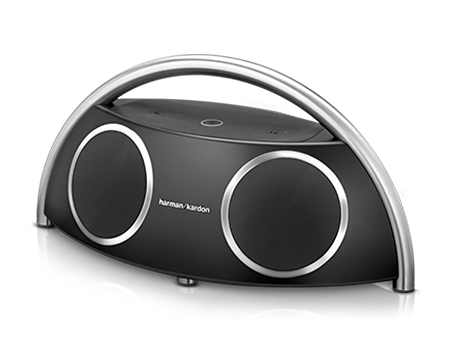 You get the powerful, distinctive Harman Kardon sound you've come to love – in a pristine, portable package. So grab the sleek, stainless-steel handle and take beautiful sound wherever you go. Dimensions - 20" x 9" x 9-1/2"